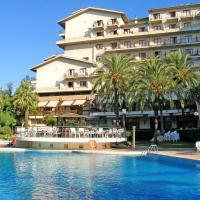 It is going to be very hot at Benicassim why not consider booking a hotel, The festival takes place through the night. The day time is very hot so it will be really hard to sleep. We therefore suggest you book a hotel. There are many hotels in great resorts less than 15 min drive from the festival site, so either hire a car from Lastminute or grab a taxi or shuttle bus to the festival. Remember Benicassim Festival takes place between 18th – 21st July 2019. The Most Popular Resort by far is Oropesa Del Mar it has some great hotels and is only 5 miles from Benicassim Festival Site. Other popular resorts include Castellon 6 Miles Away Alocober 20 Miles Away and Peniscola 36 Miles Away. Really popular option for Benicassim Festival goers is booking an apartment or hotel, this often allows you to book more people, and also give you more comfortable time, and during the day you will have access to a pool and air con !! These are currently apartments and hotels with availability in benicassim during the festival week. We suggest you book quick as they are selling out fast. so if you are looking for an apartment near benicassim festival or hotel near benicassim try these for size. Hotels in Benicassim include the nearest hotel to the festival site Intur Orange Hotel and also Intur Bonaire Hotel and Trinimar Hotel. We have compiled a list of the top 10 hotels booked for Benicassim you will see Oropesa Del Mar is a very popular resort, being close to benicassim, but also far enough away to chill out after a night at the festival. Lastminute.com have flights + hotel package which include transfers from the airport. These Lastminute benicassim festival travel packages take all the hassle out of getting to benicassim. They currently have packages for the following hotels Intur Orange Hotel Intur Azor and Intur Bonaire. Just select a hotel below and then on the lastminute website choose the exact dates you wish to travel and from which airport as easy as that. I offer myself as a driver with my car, really cheap comparing taxis, shuttle buses and so on, if you are interested send me a message and i will pick u up and take u !! we stayed in hotel trinimar, 3star hotel right on the beach! really nice, rooms were grand, breakfast was good too, lovely garden with a pool out the front, staff were really nice also. 5mins from supermarket and restaurants along the beach for dinner and then about a twenty min walk up to festival! so handy getting somewhere within walking distance cos u can go home whenever u like and don’t have to depend on buses or taxis, had to get a taxi home in previous years- queue was hours long! Should have done that (stay in a hotel).. Cause the campsite sucked big time if you ask me. I agree with Chantal. Everything was bad about it! The showers, small spaces and the staff! Gillian Egan where did you book your hotel was it online? Hi. I’m staying on the outskirts of Castellon and wondering does anyone know where the shuttle bus picks up from? We’ve booked a room at hotel Tramontana from 15th -22nd July. It’s right on the beach in Benicassim. We no longer need it so if anyone is interested then please reply to this message. Thank you!